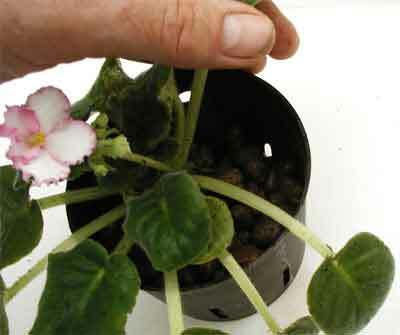 Grow amazing African Violets with our Hydroponic System! The "wicking action" of the LECA pebbles provide the perfect balance of moisture and air to the roots. Strong roots make healthy plants. 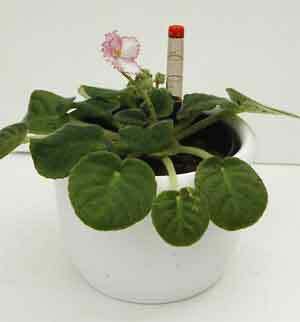 African violets don't like wet feet so always choose a hydroponic planter that's a little smaller than the existing grow pot. Big pots hold too much water and stay wet too long. Remember, healthy roots need air! Here's our candidate for transplanting so let's get started! 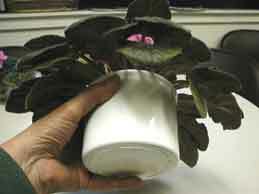 Carefully remove plant from its pot. 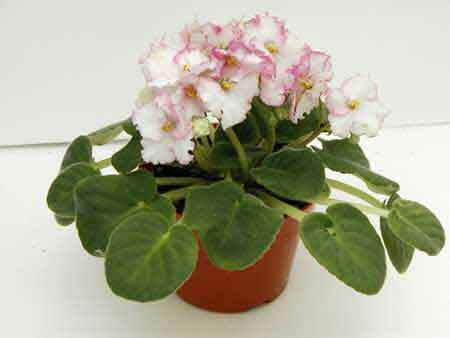 African Violets have thin, delicate roots, so handle gently. 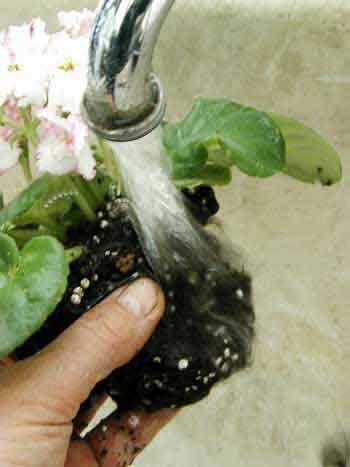 Take plant to sink and rinse away all potting materials. Water temperature should be tepid - these plants don't like cold water! It's okay if the leaves get wet. That spotting you often see on the leaves comes from sunlight shinnig through water droplets. 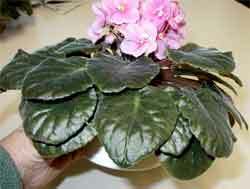 So avoid getting the leaves wet when the plant is exposed to sunlight. 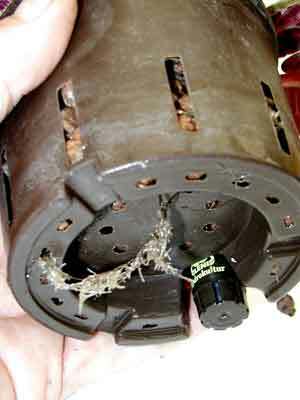 Roots after potting mix is removed. 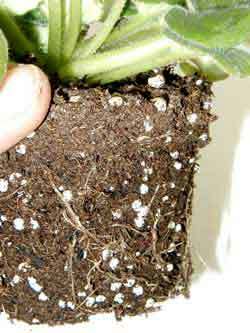 Now is a good time to remove any soil that may have acculmilated on the leaves. 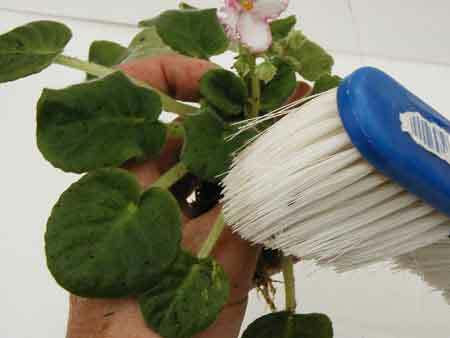 Use a soft brush with warm water. Allow time for leaves to dry before exposing to sunlight. Fill bottom of culture pot with LECA pebbles that have been soaking in rooting solution. 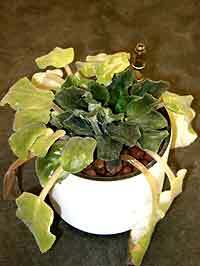 We use a 3" Hydro Planter for transfering most 4" plants. 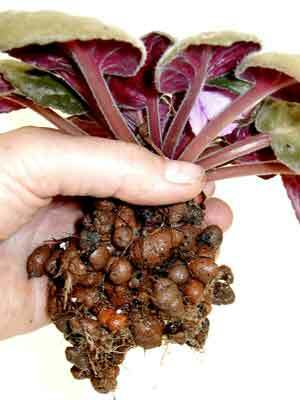 New transplants don't have a lot of roots and a smaller pot promotes a better wet/dry cycle. Large pots stay wet too long. Postion violet in center of pot and carefully fill with pebbles. We suggest planting slightly deeper than soil if possible. If your new transplant is wobbly and looks too high, dump out pebbles and start over. New transplants don't like wet feet! Notice I have removed plant (and culture pot) from outer pot for watering. Water by simply pouring diluted rooting solution through the pebbles twice a week or so. 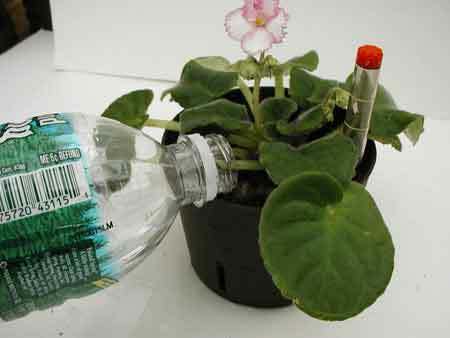 Using water gauge as a handle, return plant to outer pot. No standing water at the base yet. Give your new transplant some time to aclimate its new home. For the first couple of weeks, water plant by simply pouring water through the pebbles - no standing water at the base. 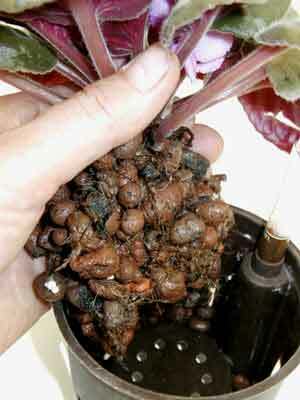 (Using the water gauge as a handle, lift plant and culture pot from outer pot and slowly pour water through pebbles). After this initial period, water to 1/2 or "Opt" on the gauge. Then wait until the system is competelty dry before rewatering. This should take 2-3 weeks. 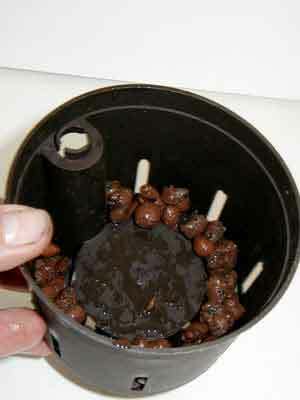 To make sure system is dry, use water gauge as a handle and lift plant to check the bottom of outer pot. New roots growing out the bottom of the culture pot means a healthy plant. 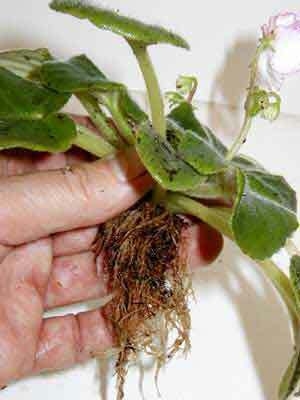 I have removed an established plant from its pot to show new hydroponis roots. Roots actually attach to the pebbles. 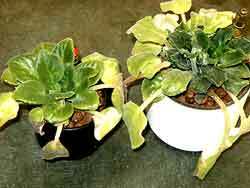 Don't worry about older leaves tuning yellow after transplanting. These plants are getting acclimated to the system. Just remove old leaves and then watch your plant grow new, stronger leaves and brighter blooms! You'll see the difference!